Two and a half centuries ago, Americans burned firewood to warm their homes and whale oil to light their lanterns; energy was generated largely by manual labor and animals. Fossil fuels changed everything, igniting the US economy, swelling its population, and boosting quality of life. Today, of course, those same practices are threatening environmental and economic turmoil — and forcing scientists to right the wrongs that fossil fuels have created. Since the mid-1700s, humans have emitted an estimated 1 trillion tons into the atmosphere, Majumdar said; based on remaining fossil fuel reserves, we may emit up to 3 trillion more — and likely more, as technologies continue to improve — all within the next 100 years. The value of those fossil fuels: tens of trillions of dollars. Energy costs for these sustainable technologies are dropping — solar power costs between 12 and 18 cents per kilowatt-hour, while wind is between 5 and 12 — and capacity is drastically improving. But inefficient technology, a lack of infrastructure, and the absence of widespread tax incentives and supportive policies prevents mass adoption. Some potential game-changing technologies remain far from the mainstream, Majumdar noted, such as projects that seek to engineer plants that can produce oil directly. A team of researchers at Lawrence Berkeley National Laboratory is working to transplant the metabolic pathways of algae — organisms that can be used as a biofuel, but with challenges — into tobacco plants. Technologies like these have the potential to reshape the energy future not just of the United States, but the world, Majumdar said. 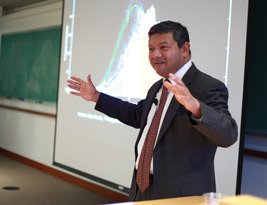 The lecture was sponsored by the McCormick School of Engineering Dean’s Seminar Series and the Institute for Sustainability and Energy at Northwestern (ISEN).